DELTA – BC blueberry farmers and some apiarists were left scratching their heads after it was reported that there would be a sizable bee shortage in the Fraser Valley this spring. In April, the Vancouver Sun reported that beekeepers, including “major operators from Alberta,” were refusing to send their colonies to the Fraser Valley this year due to health and honey yield concerns. The article said the high-alkaline levels of blueberry pollen, a lack of variety in forage to make a balanced diet and possible contamination from fungicides used in blueberry fields were to blame. When the bees returned to Alberta, they underperformed. While the concerns may have some validity, blueberry farmers say the correlation between healthy bees and healthy crop yields is what makes their operations work. “Bee health is important to every [blueberry] grower that I’ve talked to because they’re spending a lot of money on it and you want the best bang for your buck, so you want good, strong, healthy, happy bees,” says Jason Smith, fourth-generation blueberry farmer and berry consultant in the Fraser Valley. John Gibeau, commercial beekeeping instructor at Kwantlen Polytechnic University and president of Honeybee Centre in Surrey, says apiarists who decided not to send their bees to BC this year may be making a mistake. He recalls when apiarists would not charge anything to place their hives with blueberry growers because the bees’ health and honey was worth it. 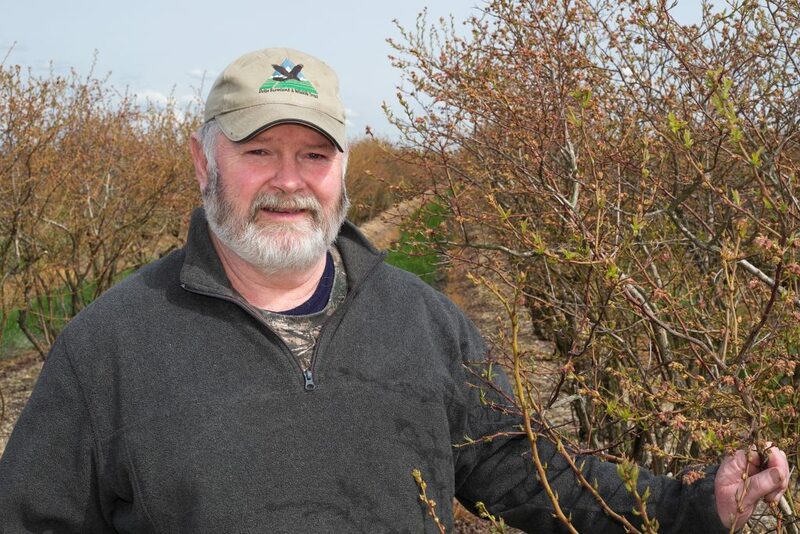 When asked why some colonies have done poorly recently, fingers pointed to the wet conditions in the Lower Mainland and Fraser Valley during the blueberry flowering period last year. The effect of fungicides, which growers spray for mummy berry, is currently unknown, van Westendorp says. Growers say the use of fungicides is often guided by Integrated Pest Management protocols, which help protect good insects such as pollinators. “Among some beekeepers, it’s become the proverbial holy mantra; they think it’s the fungicides that have caused the damage,” he says. To address the concerns, the BC Ministry of Agriculture and other parties have offered financial support for a multi-year study involving scientists in BC and Alberta that will conduct a proper assessment of the effect particular fungicides have on colony health. The study will begin this year as the blueberries blossom. Wintering bees in Southern BC has been a long-time practice of beekeepers from the Prairies. As many as 40,000 hives make their way to Southern BC from as far away as Manitoba every year to take advantage of the comparatively mild winters, says van Westendorp. Most of those colonies are not involved in blueberry pollination, he says, but the apiarists find there is less risk than when the bees spend the winter east of the Rockies. The bees also get up to an extra month of forage, meaning more honey production. “The business of adding a pollination contract to it is a more recent phenomenon that only a few have taken up,” he says. “I have learned that, in the meantime, because of the speculative environment, that those beekeepers who do make their colonies available have been jacking up the price enormously,” he adds. Despite the reports, the BC Blueberry Council, with a membership of more than 600 farmers, says growers are not experiencing an abnormal colony shortage. “To our knowledge, the majority of our growers … have not expressed concern about a lack of bees to pollinate this year’s blueberry crop,” wrote BC Blueberry Council executive director Anju Gill in an open letter to media. To the contrary, she’s been recently contacted by beekeepers who are still looking to place their hives on farms. 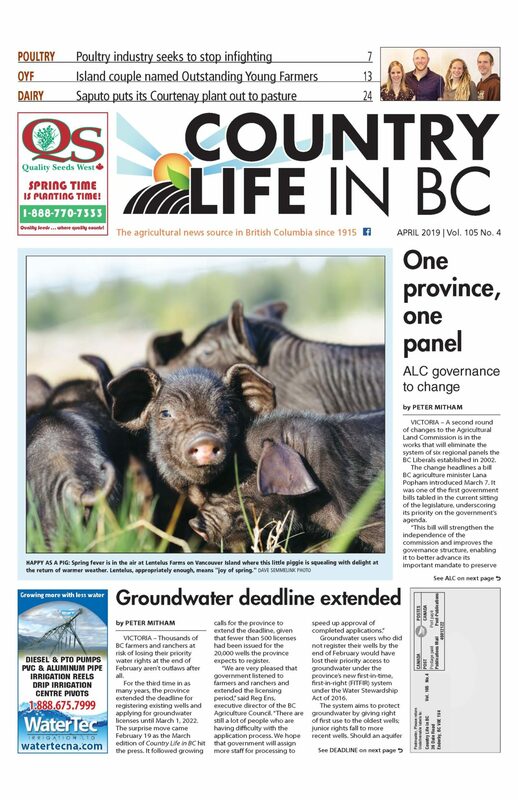 “I’ve had calls since some of these stories from beekeepers saying, ‘hey, our bees are available,’” she told Country Life in BC. Though an actual hive shortage and pricing is hard to quantify for blueberry farmers who make private deals with apiarists, Gill says she’s also heard reports the price per hive has gone up dramatically for some. “If it was about $40 to $60 per colony [in past years], I’ve even heard as high as $150 [this year],” she says. BC Blueberry Council chair Jack Bates farms 90 acres of blueberries in Ladner. He began securing beehives in the winter from various apiarists and has not noticed a shortage. He says he doesn’t mind paying a higher price for quality colonies as the larger crops he gets from three to four hives per acre is currently worth his investment. “It is reality when they say you don’t get fruit without bees,” he said as a nod toward the symbiotic relationship between beekeepers and blueberry farmers. In turn, Bates takes great care to protect the animals that help his crops thrive.